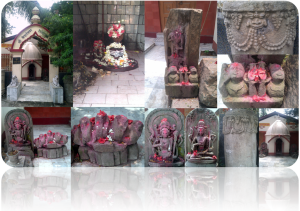 Kedareswar is another less well known Shivalaya before entering into the main gait of Kamakhya Mandir Guwahati Assam. It has a small Shivaling and out side some interesting artifacts of Goddesses in various Mudras. An interesting icon was a stone image of a five headed Serpent. I was trying to search a reference for this long time after one of my patients saw it during hypnotic session. She was suffering from panic attack of Devil scaring her which came down after she saw a five headed serpent fought and chased the Devil off.